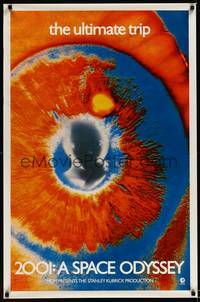 8y001 2001: A SPACE ODYSSEY 1sh 1970 most rare & desireable EYE poster, the ultimate trip! Condition: very good to fine. The poster was never folded. It has a series of small creases in the top of the left blank border and in the bottom of the right blank border, with the most minor of wear in the rest of the borders. Other than these minor defects, the poster is in really excellent condition, with no restoration or tape of any sort on either front or back!